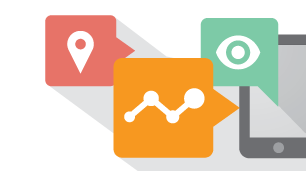 Custom Reports are one of the most underutilized methods of getting the data you need. Save time by creating custom reports for the data you need again and again. Custom Alerts make monitoring of what’s important to you easier and less time-consuming. You can look at the effectiveness of your marketing campaigns, such as changes in organic traffic vs. the prior day, week, or month, or changes in conversion rates for specific marketing channels. For ideas on effective alerts, take a look at this article from LunaMetrics, containing more than 55 different Custom Alerts. A new feature to GA is the ability to import click and cost data, similar to what is available in AdWords, into GA. With this update you can start to analyze the effectiveness of campaigns from an ROI standpoint within GA by importing metrics such as cost, average CPC, impressions, etc. from other channels like Bing or Facebook. Google offers the ability to generate custom reports from GA via its API, directly in Google Docs. This provides digital marketers and analysts the ability to quickly create and share custom reports and dashboards that get automatically updated. Here’s a video that shows you how to get started. Those custom alerts for Google Analytics can be a life saver. Thanks for including them!